Model of Black Worth Satin. Paris Spring Season 1913. Home » Model of Black Worth Satin. Paris Spring Season 1913. Model of Black Worth Satin. Black Worth Satin, draped skirt. Black Callot chiffon waist over shell pink satin overlaid with cream net top lace. Band of black satin and lace on sleeves overlaid with chiffon. Ornaments of Bulgarian colors on belt. Fancy buttons. Black satin sash with heavy ornament of braid and fringe. Cocktail dress by couturier Charles Frederick Worth. 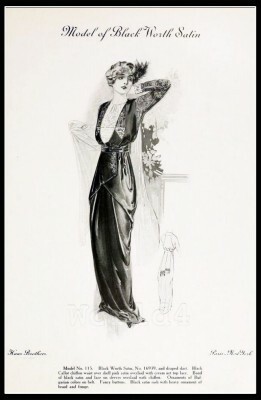 This entry was posted in 10s, 1913, 20th Century, Fin de siècle, France, Haute couture and tagged Belle Epoque Fashion, Charles Frederick Worth, Couturier, Haute Couture Costumes on 7/26/13 by world4.